B2 Business Vantage gives detailed, informative results. All candidates receive a Statement of Results. 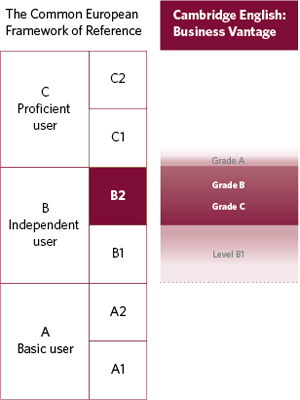 If your performance ranges between CEFR levels C1 and B1, you will also receive a certificate. Find out how to understand your B2 Business Vantage Statement of Results. Exceptional candidates sometimes show ability beyond B2 level. If you achieve a grade A in your exam, you will receive the Business English Certificate Vantage stating that you demonstrated ability at Level C1. If you achieve grade B or C in your exam, you will be awarded the Business English Certificate Vantage at Level B2. We believe it is important to recognise your achievement, even if you do not reach Level B2. If your performance falls within Level B1, you will receive a Cambridge English certificate stating that you demonstrated ability at Level B1.